Schützengeek - Blogging by John Buol: First Class of 2008 complete! Our first group of new instructors graduated from our class here at Camp Bullis. 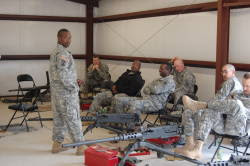 Course work included weapons-related Warrior Tasks, marksmanship instruction and practice, training on current US-issue small arms and instructor teach backs. Thanks folks, and good luck!